Jay Shafer brought tiny houses into the public eye when he appeared on The Oprah Winfrey Show (original video here) in February of 2007. At the time the idea of living simply in a small space was refreshing approach that inspired many to follow. Jay’s Tumbleweed Tiny House Company thrived over the following years as more and more people discovered tiny houses. Be sure to sign up for news & updates at fourlightshouses.com. You can also find Four Lights Tiny House Company on Facebook, Twitter, and Pinterest. This entry was posted in Announcement and tagged Four Lights, jay shafer, tiny houses, tumbleweed, village, Workshops. Good point, Mike. I totally agree. I’m actually designing this place with ample garden space. If all goes as planned, it’ll also be reasonably close to Trader Joe’s or something like that. “Self-reliance” (in the absolute sense) isn’t something I, personally, am striving for with a small house. Remaining connected without being a slave to the bank and consumption is more my speed. I think smaller houses are one way to this sort of self-reliance, or community or both. Even at an average of 400 sqft per house you still have at that density over 35,000 sg ft left over in the acre for yards, paths,common areas,community building,and as mentioned in the article private gardens. If you can’t read,don’t jump. It is very unbecoming. Yes I live in a tiny trailer mounted Bungalow that I self reliantly built ,have no mortgage,and garden to my self reliant delight! I didn’t bring up any of point as some sort of contest, Robert, just as an observation of the priorities many tiny home proponents have. I certainly didn’t bring it up so that you could smugly and incorrectly imply that I didn’t read the article and don’t know what I’m talking about; you were saying something about unbecoming behavior. “Private gardens” doesn’t really mean gardens which produce food to most people, not even those in the tiny home movement. Clearly from the illustration, the 800 – 1600 s.f. common house and 1.5 parking spaces per house parking lot, and private storage units take up about 21k sq ft, with the houses taking up about another 8k, leaving you, if you squeaked out every sq ft of useable space, roughly 14k sq ft. Speaking from actual experience, even using the entire 35k sq ft for food growing space for 19 households is really far-fetched, even with intensive, permaculture techniques (which usually involves some livestock), and there is no way it’s going to happen with 14k sq ft, and then power, and water…I think our definitions of self-reliant might be different, and our understanding of tangible land use are clearly so. I’m happy you live in something you built (not sure our definitions of ‘self reliant’ are the same), and have no mortgage. I too live completely debt and mortgage free, my home is about 600 sq ft, only it’s on 80 acres of land which produces all the food, water, and power I need. Every board foot of timber was sourced on site, and everything else is either locally crafted or US made. It, along with the barn and animal pens were built by myself and three family members. I haven’t yet heard of or met a mortgage-free, tiny-trailer home owner that doesn’t need to shop for any of their food or haul water (or use RV hookups). Like I said before, our definitions of self-reliant obviously differ. Nice to know that a small family needs 80 acres of land to be self sufficient. At least in your case. You have taken the term self- reliant and turned it into some sort of frustration on your part as it relates to Tiny houses. 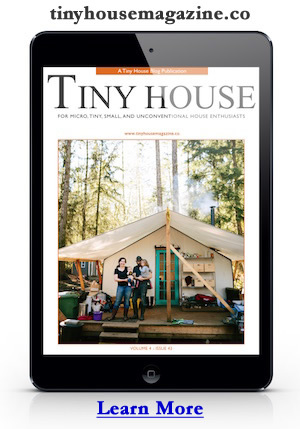 Living Tiny does make by necessity most tiny house dwellers more self-reliant. It is the nature of the life. A community such as planned will draw like minded inhabitants and while not your cup of tea,will yield some of their food needs,some of there power needs (solar) and at the density illustrated a neat use of land. I really don’t understand your objection to the idea or your distortion of the word self-reliant. It is never a word used in total. The Tiny House movement context is more self-reliant. At least as someone who lives the life you describe,you should be able to grant that simple point. I didn’t say I *needed* 80 acres, I said I lived on them, I’m not sure why you seek to find offense with what I’m saying. I also never mentioned the size of my family so I’m not sure from where you get “small family needs 80 acres” at all, I think you’re just making silly assumptions because you fancy yourself “right” in this thread, when there are no winners to a discussion of differing opinions. I really hope you get to move your home to that 5 acre farm you want, and that you get to experience the self-reliant lifestyle I’m referring to, where all your food, power, water comes from what you built. I took a look your place and I like what you showed on the video, I didn’t see much interior shots, but I’m sure it’s nice as well. It looks like you’re on your way, but please stop trying to suggest the size of your house has a relation to your level of “self reliance” because you live in a small house than I do, but I don’t create the demand resources to support my lifestyle that you do. Take care, I wish you the best of luck! Why would you be frustrated with that philosophy? Seems like a reasonable goal to me. Jay Shafer may of brought the Tumbleweed homes into the public eye but tiny homes were around many years before he was ever heard of. Tiny homes were in the public eye long before personal computers were common. I first became interested in tiny homes from their public display at the Sacramento State fair in CA back 25 plus years ago. The tiny straw bale home plans were aval for sale to the public. The company (don’t remember their name) also had an option to have them build on your land. I had a 240 sq foot home built in my friends back yard and lived in it for four years back in 1990. Several people I knew at the time had tiny homes. Tiny homes and many other topics just became more well known since the growth of technology. There have been tiny home dwellers for MANY years, way before Shafer popped up. The problem with calling those of us who have built, live in or like tiny homes a “movement” is that it somewhat indicates everyone wants to live a self reliant life or be a minimalist. I own a tiny home and do not fit into either category. I love my “stuff”, have no intention of becoming a minimalist and while I own my own rural land with well water, I love to drive to Trader Joes and other stores to buy the majority of my food. To each his own. Fantastic looking home and a wonderful story. Thank you for proving my point. Absolutely delighted! Have followed you, one of your biggest fans since the article in Natural Home magazine, 1999 or 2000, and still hanging on! Really interested in the community living. Also interested in floating home communities, how about Oregon? …Still frostbitten in FAI. Wow! It is the perfect thing to do at the perfect time; I can’t wait to attend the workshop. My positive thoughts are winging their way to you and your staff. One suggestion: could you consider a different subtitle for the Napoleon Complex other than ANTI social? CoHousing is abbreviated for “Collaborative Housing” and requires at least a desire to fully cooperate with many people on a regular basis. CoHousing is a good thing for the socially-challenged (like me). Maybe you could change the subtitle to “CoHousing for the quasi-social”. That is much more likely to be the type of people you will be attracting. Wonderful to see that the split off was for all the right reasons. More creativity is essential when building tiny homes since that’s what really makes a space that small livable. I’m currently in the design process for my own tiny home, and I love seeing different ideas for different homes. Actually building half the roof into a sundeck to further increase living space. Kind of surprised I haven’t seen anyone try it yet. Good luck with your project Jay, I’m glad to see you’re continuing to innovate! I do not think the intent was to have an argument about what self reliant means. I am interested in the tiny house for independence. And yes my definition is probably different than many peoples. I know I will still have to purchase many of my needs from American stores. But what I would not necessarily have to pay as long as I keep it mobile is property tax which is getting ridiculous. Yes I know the cost of gas is also ridiculous. People have spent years buying bigger and bigger homes and all that has accomplished is to make it possible for a family to live in a home and almost never see each other. I am now a single person so having a large home makes no sense. I have no problem paying for the use of facilities needed to dump the unmentionables or to occasionally have electricity. What use is owning land when the laws are set up to tell you what you can and cannot do with it. Having to have permits for everything. It is just another way for the government to get more money. Needless to say I am very tired of it.